The purpose of this review is to summarise the literature that supports the importance of the food-based dietary guideline on water consumption. General recommendations for total daily water intake are between 2 and 3.7 l for women and men, 0.7 l for infants aged 0-6 months, 0.8 l for infants aged 7-12 months, 1.3 l for children aged 1-3 years, and 1.7 l for children aged 4-8 years. Water recommendations for the elderly and people who are involved in exercise or hard physical labour may be higher and might need special consideration. Water remains one of the primary sources of fluoride, and in areas with low levels, the fluoridation of drinking water is recommended. Defluoridation of water is suggested in areas where water fluoride levels exceed 3 mg/l. 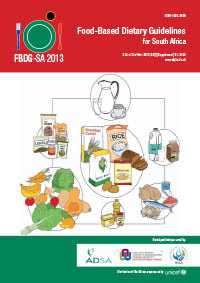 There is a paucity of South African data on general fluid intake, but some evidence suggests an increase in the intake of energy-containing beverages and in the demand for bottled water, posing unique challenges relating to weight gain and diabetes incidence, and effects on the environment and chemical leaching, respectively. Water quality remains a concern. Low rainfall, declining fresh water sources and the impact of industrial activity, urbanisation, climate change, deforestation, mining and agriculture add pressure on water bodies. This effect on water quality could lead to water-borne illnesses and disease. Managing the quality of drinking water is of utmost importance, and pertains to the microbiological and chemical safety of water, as well as to the physical and organoleptic qualities of drinking water, which is an important cornerstone for health.